This week our Assistant Superintendent Cameron Watt sat down with one of our newest Turfcare team members to help us introduce the face behind all the flowers at the Redwoods! Jean-Paul Raymond, JP for short, is the Redwoods’ horticulturist that joined us in early spring. He has a gardening and landscape background and came aboard for a new opportunity. If there is anything more you want to know, whether it’s horticulture or personal, you can find JP smiling away in one of our gardens doing a fantastic job keeping them beautiful! CW: How did you become involved with Team Redwoods? JP: I was trolling craigslist, looking for anything new or exciting. I was motivated for a new change for some time, something that could maybe help accommodate my personal life and goals a little better. I saw the ad for horticulturist and was intrigued, what an exciting and cool opportunity it could be working on a golf course! I applied and got the call for an interview. I thought about the possibility of new overwhelming responsibility, maybe I wasn’t really worthy (as he laughs). But then again as a career building bonus, I thought if anything, this could help improve my interview skills. I’m very excited to have been offered the position. CW: Give me a brief background of your work history. JP: When I was younger, I was a bike courier for the city of Vancouver. Every day in my shipping travels, I would see gardeners and landscapers working outside of the many buildings. They all took lots of pride in their work because of the beauty and creativity. The results were always awesome. I was curious and began asking them many questions. I was hooked and I just fell in love with it. That’s when I made the decision to get into gardening. CW: What might your new colleagues be surprised to know about you? JP: Nothing really (as he chuckles). I own a landscape company for which I do side jobs and projects. I’ve owned it for about five years. I am a proud father to twin boys. *What JP wouldn’t say on record was his ex-BMX skills and success when he was younger, I saw the pictures, impressive! CW: What do you enjoy most about Redwoods? JP: The entire team here from every department is very friendly, I love the country feel and family atmosphere. The people that golf here is friendly, I love communicating with all of them about gardening. I also really enjoy the progression of my work, seeing the results happen. This whole place just has beautiful surroundings. I also really love the coffee (laughing). JP: I’ve been gardening and maintaining landscapes professionally for 20 years. I get to be creative with colours, scents, structure, and balance. The results are always so beautiful and I love that—that’s what keeps me motivated. CW: How would your friends or family describe you? JP: I guess in a couple words, a quirky comedian (laughs). CW: What do you enjoy doing when not at work? JP: Spending time with my family. We have a trailer at Cultus lake and it’s the perfect place to spend time together having fun, sharing memories. We try to go there often. CW: Is there anything I missed or anything that you would like to add? Golf gets its name as the Game of a Lifetime for a reason: this single sport manages to bring together social interaction, athleticism and exercise all in one 4-5 hour time period. So not only are you spending time with your buddies, but you are fine-tuning an athletic skill set as well as fitting in a great work out all at the same time! You are probably aware that there are many benefits to golf but for now, we will just focus on a few of the health benefits of the game because you might just be working harder than you think! 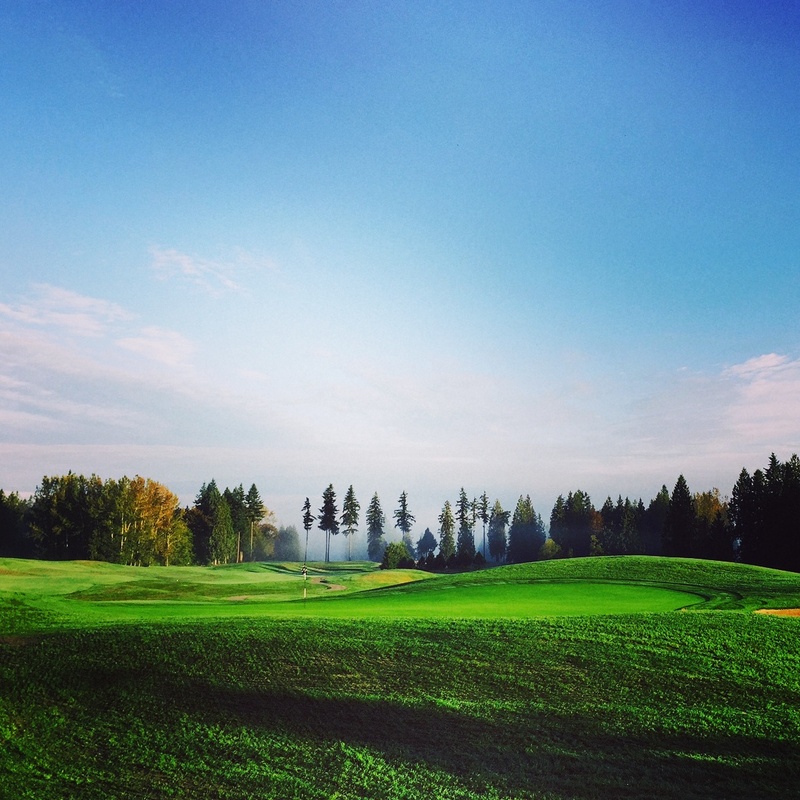 During the average game of golf, if you forgo the cart, a golfer ends up walking over 8km! That is like walking from Redwoods Golf Course all the way to the Freeway entrance at 176th street in Surrey! In just one 18-hole round a golfer burns up to 2000 calories if you carry your clubs instead of taking a pull cart! This is the equivalent of running on a treadmill for 2 1/2 hours …who would prefer to do that over playing around with your friends? Combine this with the hills we have scattered all around Redwoods and you will surely get your heart rate up during the game. Even if you choose to take a cart you can still burn around 1300 calories over the round. Although there are many golfers who play the game in all kinds of weather conditions, a lot of golfers seem to be fair- weather players. This means that in one game of golf you are spending around four or more hours in the great outdoors breathing fresh country air deep into your lungs, and soaking up plenty of Vitamin D. Vitamin D is great for bone and muscle strength as well as immunity. While only 10-20 minutes of sunlight exposure produces a sufficient amount of vitamin D for the day, we West Coasters will rarely turn down a little extra sunshine on our skin! While it might feel a little stressful when you aren’t playing your best, the overall combination of being outdoors, spending quality time with friends, and exercising is enough to put anyone in a fantastic mood free from the stresses and worries of the daily grind, at least for a few hours. So next time you book a tee time and are out on the course make sure to remember all of the benefits that your round of golf is having on your health, and maybe swing by the restaurant to grab a pint and a bite to eat and celebrate it after! Golf is the game of a lifetime--why not share your passion with your kids or grandchildren?! To help our loyal golfers with just that, we have added brand new Junior Golf Tees to the course! These specialty tees are placed off to the side of the fairways on the front 9 holes of the Redwoods with designated yellow tee markers. The 9-hole, par 3, 1500 yard course gives the youngsters in your life the opportunity to experience playing golf at a championship facility. The Junior Golf Tees feature holes ranging from 230 yards par 5's to 50-yard par 3's. 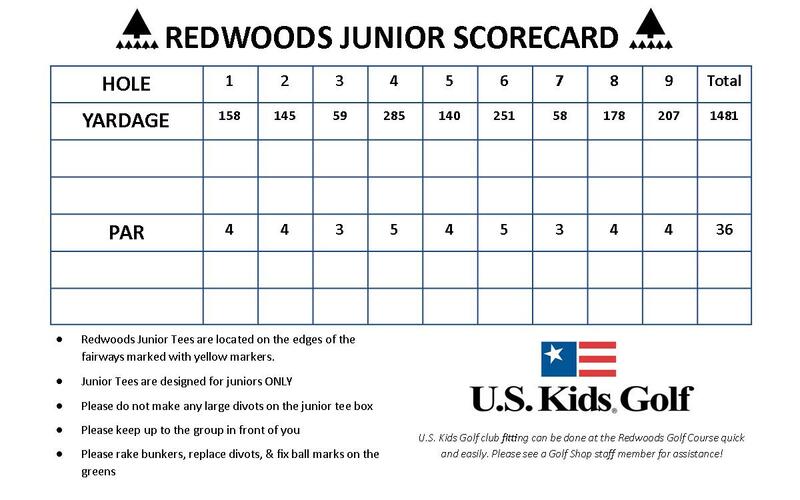 Specific Junior Golf Tee Scorecards are available at the golf shop upon check in! 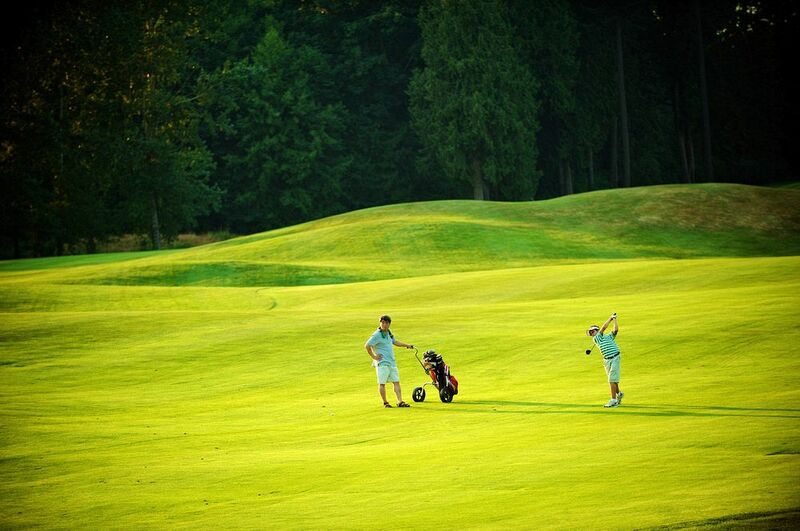 Did you know that kids 12 and under golf for FREE at the Redwoods?! When accompanied by a paying adult, all children 12 and under golf free of charge which pairs perfectly with our Junior Tees! At Redwoods we want to do whatever we can to help introduce a new generation to the great game of golf; our Junior Tees are just one step that we are making in that direction. So come on down, check out the new tees, and maybe even sign your son or daughter up for some lessons through Camp Redwoods! They will be loving the game, and maybe even beating you on the course in no time! At Redwoods we thrive off of taking new ideas and turning them into reality—we love staying ahead of the curve! If anyone has been following our social media accounts on Twitter, Facebook, and Instagram (links below) you may have noticed that something is in the works at Redwoods! Since early March we have been keeping a secret while posting pictures trying to lead our followers in the right direction… and our project is finally complete! Redwoods is now the owner of a completely redesigned and fully functioning Food Truck! Decked out in the classic Redwoods red and white, the Team Woods Food Truck will be featured at all of our shotgun tournaments starting this year! Equipped with all of the bells and whistles, our Food Truck is built to accommodate all kinds of food for shotgun tournaments to enjoy during tailgates. Don’t forget to follow our social media accounts so you can keep up-to-date on all of our projects and events! 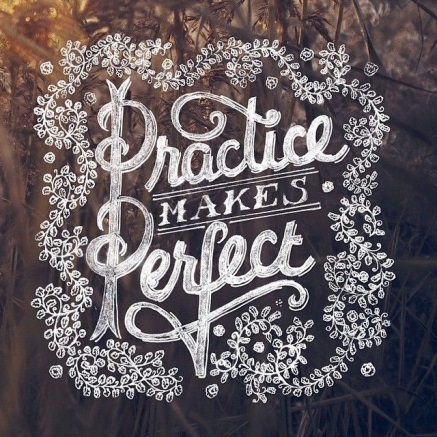 Practice makes perfect. This statement is true with pretty much every sport or activity you were involved in growing up, and the same stands true on your wedding day! A wedding rehearsal only takes approximately 30 minutes but it is a truly effective tool to help your wedding day go smoothly. Your wedding is the highlight of the weekend and your rehearsal dinner should be a reflection of the creativity and effort you have put into pulling it all together. Traditionally the rehearsal is held the night before the wedding; however recently the rehearsal has become more of a celebration of its own rather than just a formality. Here at Redwoods couples may hold their rehearsal any evening during the week leading up to their big day starting anytime before 5:00 pm. With this kind of flexibility, there is a lot more time for the couple to relax, recuperate, and get ready for their main event! Why not let us host your rehearsal dinner?